It is about 2 or so inches between compressor housing and the rad. Problem is there is like quarter inch between the wg and the rad. I can put a fan between the fmic and the ac condenser but it has to be a 10" fan which I am sure will be fine, but I would rather not do that if I don't have to. I will have to look at it next week being I am out of town this weekend. I will let you guys know. Gotcha. 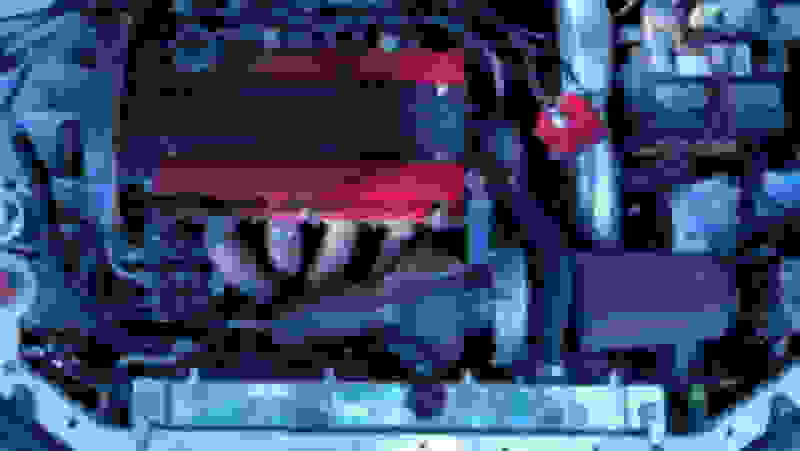 The engine will rotate about the axis defined by the 2 mounts on either side of the engine with the DS mount being lower. If the wastesgate is about the same height as that mount then I would not expect it to get much closer, if any, to the radiator during engine torque. Just make sure your front engine mount is sufficiently stiff. A pusher fan is not as efficient as a puller fan, but it is much cheaper to do the 10" pusher on that side as opposed to re configuring of the entire setup. I would probably take that approach and see if you have any cooling issues before spending a lot of time and money, which you don't have. 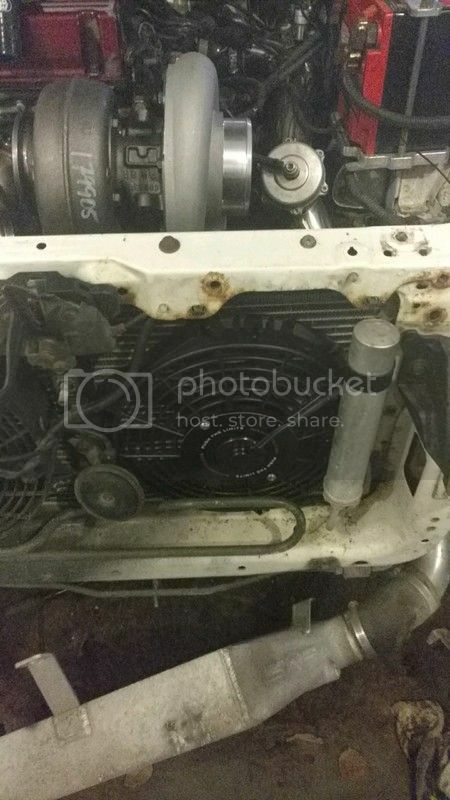 How does the turbo clear the inlet to the radiator? I had looked into the Mirage rad and with that I would be able to use my Maradyne fan that I have and it would be plenty of cooling. Problem is with this setup I point back to the first picture with the rad hose hitting compressor housing. Now I did look into cutting the hose down to where it would work, but it would be short on the rad side. I have been looking at push fans and yes I know they aren't as good but I do believe I can get a 10 inch Maradyne fan in there and still be able to push 900 plus cfm. That should be enough to keep the engine cool. Well what I thought I had to do did work. I hate using them but Mishimoto 10" fan fit right in there. Flows 950 cfm which should be enough to push through to the rad. 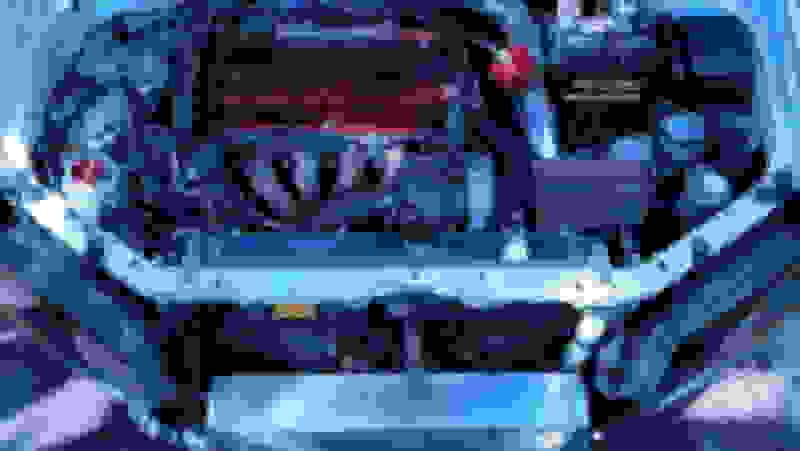 Sorry the pic is bad and car looks like ****. I put the fan on and bolted everything back up and everything fits like a glove. Now I just have to finish the rest of the ordeal and get it back on the road ready to tune. Hey man so... Like your self i have run into the exact same problems. I have the JMF topmount but mine is the pte vband with a 6466, I'm currently installing the whole setup, Both the upper & lower rad hoses don't fit. Like you said the slim fan don't fit as well. I'm also running the full sized evo 4/5/6 Mitshi rad. What a nightmare for something that is supposed to fit with minimal work on a small turbo. What did you do for the lower rad hose? mine gets sandwiched between the Clutch slave cylinder and the Tial MVR wastegate. My rad hose fits with the smaller rad. Everything lines up but as you can see the one wg hits or is stupid close to the rad itself. I had to mount my fan as a pusher instead of puller in front of my ac condenser. That is the only way I could get everything to work out. I want to keep my fan control so now I have to fab a bracket of some sort to get it where it needs to be, but yet out of the way of the dump tube. I will post pics of that when I get it done. I am still having problems with the thermostat housing and -16 fitting. I have to recut and reweld a new bung closer to the housing to make it fit. I will show you guys what I mean when I get back home on sunday. 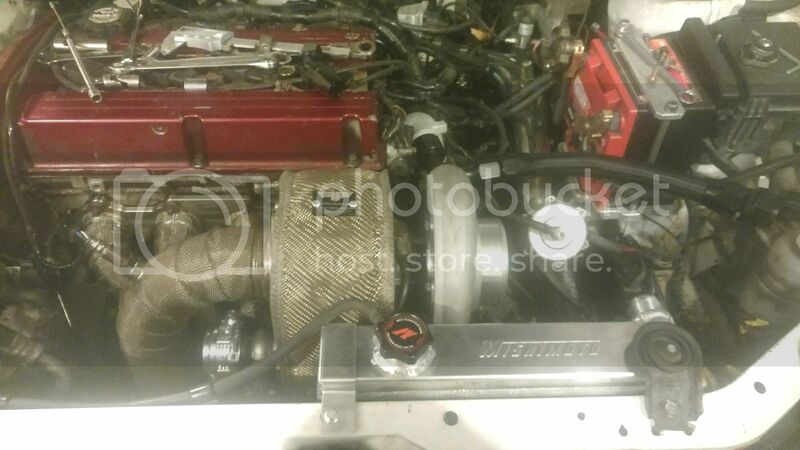 So I finished installed everything yesterday, made a custom lower radiator hose and custom upper radiator hose, I used an 11" slim fan just like you did and pulled the AC dryer unit out abit to make good clearance. 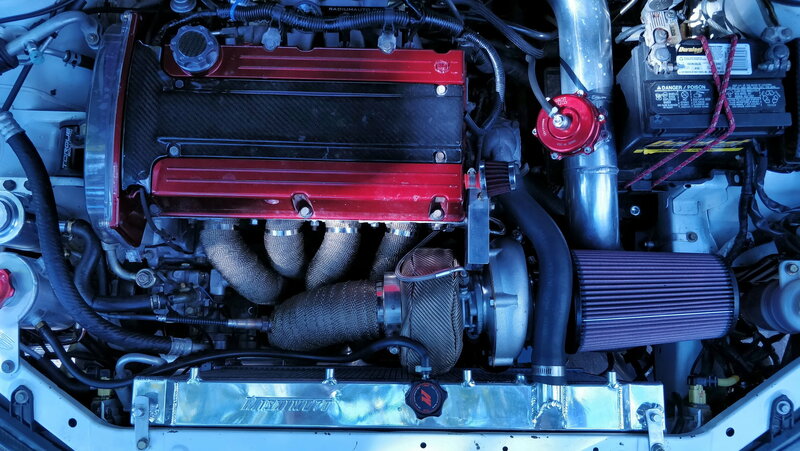 My setup is now JMF top mount 6466 vband in/out with full 4" turbo back exhaust from ets. Biggest pain in the *** was the oil lines. Showing all AC still intact with stock ac fan on left and 11\" pushing fan on right. You did a really nice job on that. My Borg wont fit a full size rad in there at least mine wont. My old rad was 2.5" thick. I like how you did the same thing I did and used a blanket. I wasn't sure if I would do heat wrap around the mani and exhaust mani but after seeing yours I may do it. ****ty thing is everything is together minus down pipe to the rest of the exhaust being I have to adjust the rest of the exhaust. its cheap and it works good make sure you soak it in water wear pong sleeves and gloves lol it's bad in your skin. I did this mainly to keep temps lower under the hood as I have the 3.8" garrat ic and factory AC and to pusher fans in Florida don't wanna overheat. But yea your luck your lower rad fits my Wg is located in a different spot then yours it leaves me 1" between the clutch slave and the WG for a lower radiator hose lol... So I have to go all out custom and buy a gates f150 radiator hose and cut and modify it In 2 spots. But heat wrap is always best thing imo. Less heat more power! Thanks man, yea your BW turbo is very big, the exhaust wrap I always use is Lava exhaust wrap its cheap and it works good make sure you soak it in water wear pong sleeves and gloves lol it's bad in your skin. I did this mainly to keep temps lower under the hood as I have the 3.8" garrat ic and factory AC and to pusher fans in Florida don't wanna overheat. But yea your luck your lower rad fits my Wg is located in a different spot then yours it leaves me 1" between the clutch slave and the WG for a lower radiator hose lol... So I have to go all out custom and buy a gates f150 radiator hose and cut and modify it In 2 spots. Yeah the Borg is a monster for sure. I bought the lava turbo blanket and it was a nightmare to do with the damn ss wire to tie it so I will be ordering the springs. Sadly I am going to have to take everything apart I did last night being after I saw your pics I saw what you saw in keeping the heat minimal. Being I don't live in Florida, but it will get hot here in Michigan this summer. I Did find a solution that I believe will work actually I found a few that will work. 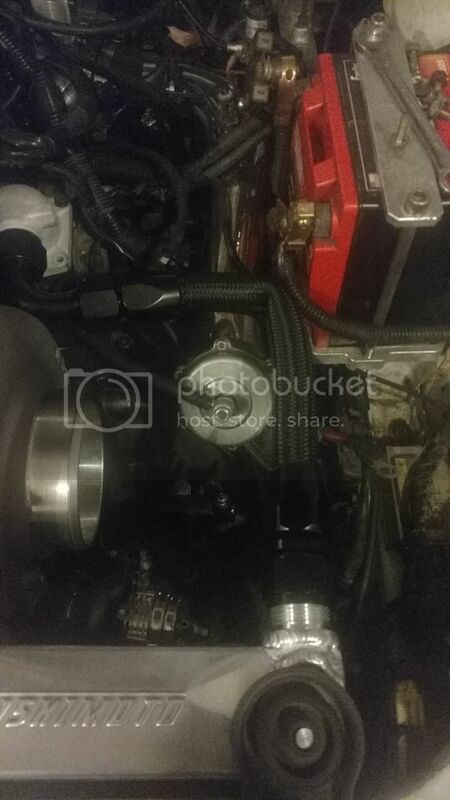 The other option I have will be to recut the -16 fitting and reweld a new one closer to the body of the thermostat housing and hopefully give me the clearance I need. I am looking toward the option above so we will see. I will let you guys know when I can get stuff in and reinstalled. Solution would be to do another 90 and call it a day. This is what it looks like without the line hooked up. Get a new thermostat housing top, and weld the AN fitting on so that it comes out the side and cut off/cap the factory outlet. Then you could use a 45 or 60* fitting off of there and a straight or 30* fitting on the radiator. That manifold clearly wasn't really intended for use with the big Borg Warner turbos. Could you put a 45° fitting coming off the radiator, take the 90° from the thermostat and clock it up higher? It would arch the hose up toward the hood but may not kink like that. This is assuming you can rotate the 90° without hitting the turbo. It would also give you a little room for the air filter since the line would be going up and over it. Yeah I had thought about that. And yeah I don't think that mani was designed for Borg stuff. When I called to have it done I told them what was going on it and had to send them my hotside for them to get it right. It actually hits the turbo a little bit. 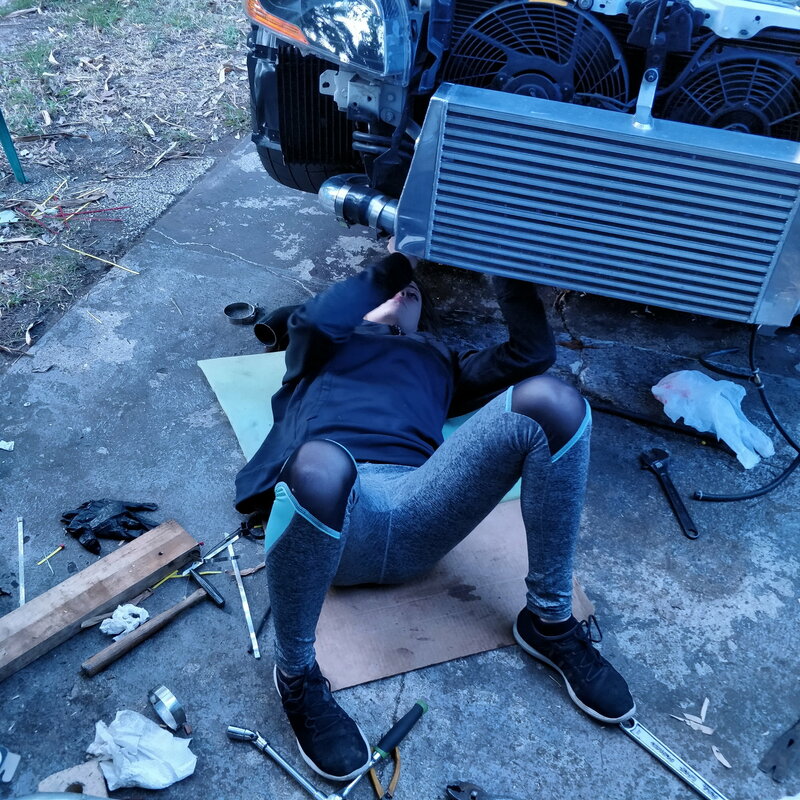 What I ended up doing is female 90* fitting then I will use a male to male union then I will use the fitting on the car to go into that and then to the rad. Need to account for the engine rotation when you redo the hose so there needs to be some way to absorb the movement. Those look like -12 hoses so they are going to bend very much in such a short distance. Looking forward to seeing more pics.